WASHINGTON -- North Korea's key missile site has not been dismantled further since August, a US website monitoring the regime said Thursday. 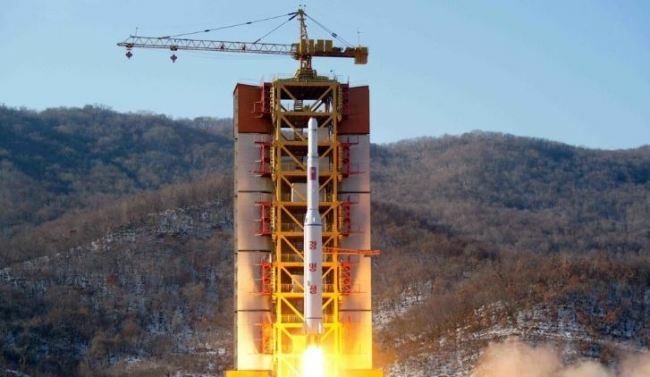 North Korea has pledged to dismantle a missile engine testing site and a launch pad in Dongchang-ri as part of its stated commitment to denuclearize the Korean Peninsula. 38 North said satellite imagery from Oct. 31 indicates there has been no additional dismantlement activity since August. "Components that were previously removed remain stacked on the ground at both locations," 38 North said in an article posted on its website. Meanwhile, the imagery shows new equipment, possibly for ventilation, installed on the roof of a fuel and oxidizer storage bunker at the site. "While the new equipment seems to have been installed between June and July 2018, previous imagery until late October had insufficient detail to distinguish between partial roof demolition and new equipment installation," it said. The United States and North Korea have been in talks to implement an agreement reached by US President Donald Trump and North Korean leader Kim Jong-un to work toward the "complete" denuclearization of the Korean Peninsula in exchange for security guarantees from the US. US Secretary of State Mike Pompeo and a top North Korean official had been scheduled to meet in New York on Thursday to continue the negotiations and plan a second summit between Trump and Kim.